There's something about the rubric to this Martin Luther King, Jr. essay-poster contest that just doesn't sit right with me. Can you find it? I had a debate about this with one of my friends in my department, and he said he thought the "no computer generated art" rule was good for leveling the playing field for students who may not have access to a good digital art studio. I think the rule prohibiting digital/computer generated art does the exact opposite. I think sometimes my colleagues get the impression that I hate physical art and "traditional" processes. It's not that at all. If a child has the skill to do his or her best work with crayons/paints/markers/colored pencils, then by all means, they should. But if they don't?? Talk about UN-leveling the playing field. 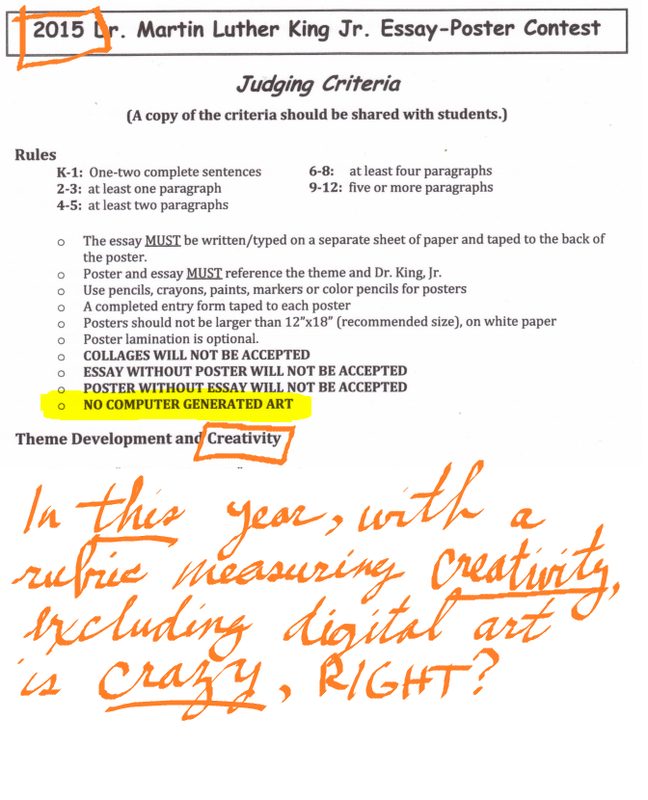 I think the only thing prohibiting digital/computer generated art from this contest does is encourage kids that can write OR do the art to cheat and have someone else do the other requirement for them, or DIScourage kids who can only write to not enter at all. Why do the organizers of this contest want FEWER kids to enter with LESS professional looking entries? I just don't understand.